The 12th & 13th of April saw the climax of the 2013/14 Short Mat Players Tour season with the Belfast Indoor Bowling Club playing host to our final ranking event, the World Masters. With 252 players participating from 6 countries, this was the largest weekend tournament ever staged in the sport, with 42 mats laid out over the 13 indoor rinks. This weekend would also see the Henselite Order of Merit trophy decided – with four players still in with a chance of taking top spot in the World Rankings, there was everything to play for. The players were split into 42 groups of 6 with the usual 5 group games followed by the 3 knockout competitions. After the introductions and welcome by the SMPT team, play got underway at 9am on the Saturday with the first round of group games. The morning sessions saw some interesting results. An historic match in Group 8 saw the UAE’s first ever competitor in Short Mat, Muhammad Arif lose out to Ireland’s Shane Magennis 22-3. World No.2 Dimitri Payne of Belgium opened his account with an impressive 16-4 victory over Ireland’s Nicholas Garvey and Irish Open Champion Andrew Leckey also won 12-5 against David Cavan. As we moved through the lunch sessions, players were jostling for positions in their respective groups. 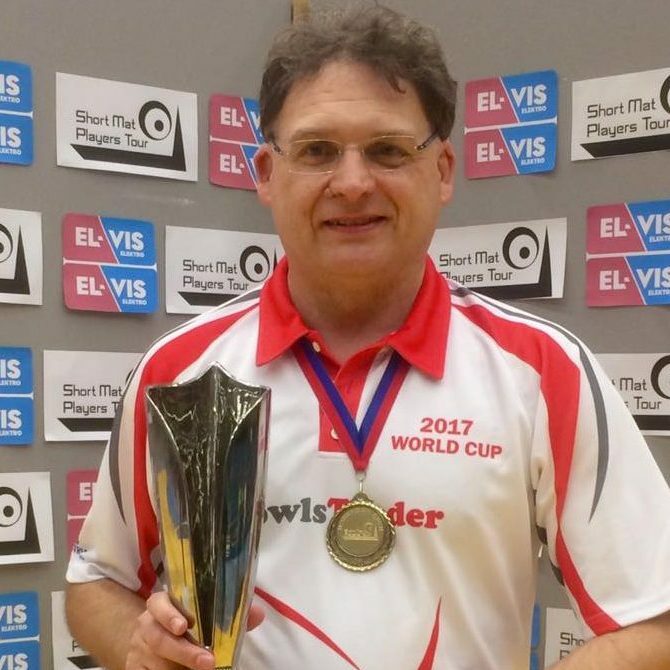 In Group 17, England’s Nigel Reed made it 2 wins out of 2, beating Ireland’s Norman Noble 11-7. Last season’s R/up Kevin Conroy also strolled to his second victory in Group 38 defeating compatriot Jamie Glackin 16-7. European Champion Chris Mann of England was finding the going tough as he slumped to his 2nd defeat, losing 13-7 to Ireland’s David Peden. With the groups now starting to take shape the all important 3rd & 4th games of the day would determine many bowlers’ fates. As the afternoon progressed some sparkling performances were highlighting potential Champions. Belgian stalwart Jonathan Payne cruised past Nicky McCaw 16-6 to head Group 39 with maximum points, and with stars like John Quinn, Leigh Harrison, Cecil Dillon & Pauline Beattie all undefeated after day 1 there was sure to be a strong line-up in the main knockout draw. 8-8 draw between Aaran O’Keefe & Noel Marsden ensured they both qualified into the main draw. In Group 20, Graham McKee edged a tight match Against England’s Steve Puttock 9-8 ensuring he leapfrogged his opponent into the main comp. Multi SMPT Champion Joseph Beattie also won 9-8 against David McRandal to top the group. So as the dust settled, all the group positions were now decided. Notable absentees from the main draw included seasoned internationals James Trott, Stephen Gale, Marty Trainor, Jal Richardson & Joel Hager, amongst many others. At the quarter final stage, wins for William Wilkinson, Richard Allen, Aaron Taylor & Joel Hager over David Crawford, Noel Donnell, Shay Edwards & James Burns respectively, gave us 2 great semi final line-ups. In the first semi final Richard cruised into a 10-1 lead against William. However 8 shots over 4 ends for William ensured a nervy finish with Richard securing a single shot to win 11-9. 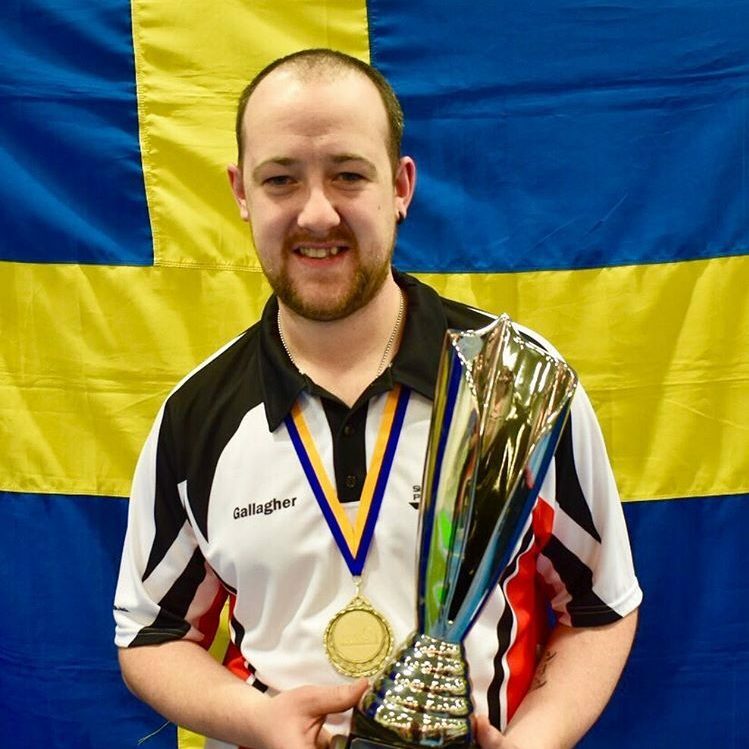 In the second semi final last season’s joint Order of Merit Champion Joel Hager of Sweden also found himself 10-1 down against Aaron and despite a similar pattern to the first semi, Joel’s comeback was also in vain as Aaron won 12-9. With a free place into a SMPT Competition up for grabs both players were fighting hard for victory. After 6 ends the game was tied at 5-5. By the ninth end Aaron had edged ahead 8-6 but after killing the 10th end Richard grabbed a big 3 shots to lead by 1. Aaron took the penultimate end with a single which left us with a winner takes all final end. Richard duly took the single shot and edged home 10-9. With some great matches taking place the quarter final line- ups were very strong. Mark Petticrew got the better of Gerard Moen 10-3. Chris Snoddy picked up a vital 2 on the last end to edge out Ryan Nixon 10-9. Also making it through to the Semi Final was Niall Cox who dispatched Brendan Murphy 12-7. In the final quarter final, England’s Chris Mann was showing the form that won him the European Masters earlier in the season as he cruised past Darren Erskine 15-6. In the first semi final Niall was in imperious form as he blew Chris away 14-5. The 2nd semi was a much tighter affair. With both players trading ends the scores were tied at 8-8 after 8 ends. Mark then picked up 4 shots over the next 2 ends to lead 12-8, Chris responded with 2 shots on the 11th end but could only manage 1 on the last so Mark scraped through 12-11. Mark started brightly with a score of 3 on the first end but some fantastic tight bowling from both players saw low counts over the next few ends with Mark leading 6-5 after 8. A further 2 to Mark on the 9th put him in pole position leading 8-5. A massive 4 to Niall on the next end however, brought him right back into the match. Mark regrouped and was able to grab 2 vital shots on the 11th end to regain the lead by 1. A tense last end saw Niall make 2 shots and grab the victory away from Mark. A fantastic match played by both players. The prelim round of the Main Knockout saw a major surprise as Irish Open Champion Andrew Leckey crashed out to compatriot Mervyn White 8-6. Also going out was promising youngster Sibe Laureys of Belgium as he lost out 14-10 to Glenn Smith. As the knockout progressed the expected challengers were setting their sites on the top prize. Defending Champion Alan Paul however could only make it to the last 64 as he lost out 12-7 to Eddie Crawford. A titanic match-up in the last 16 took the interest of many spectators as newly crowned World Champion Kevin Conroy took on new World No.1 Cecil Dillon in a repeat of last season’s semi final. Once again Kevin prevailed, this time winning 15-8. It was now time for the nitty gritty games as the quarter finals began. First up saw Kevin continue his great form as he blitzed Scott Jess 12-4 with 2 ends to spare. 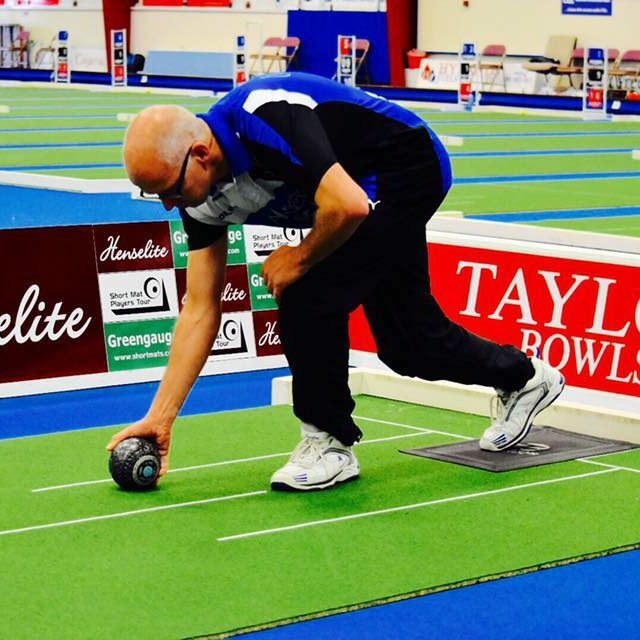 In the second match, Gerry McCabe had a great battle with inform bowler Pauline Beattie. A 5 shot run to give Gerry a 10-6 lead with an end to play was enough to see him through to the semi’s as Pauline could only manage 2 shots on the final end. The third match saw seasoned international Paul Reid easily despatch Lee Jacob 13-4 and with Eddie Crawford reeling off 7 shots over 4 ends to beat Fra Dillon 11-6 the semi final line-ups were now complete. The first semi final saw a topsy-turvy game between Paul Reid and Eddie Crawford. Paul led 6-2 after 5 but Eddie came back into it and tied it at 7-7 after 8. With the players exchanging 2’s over the next 2 ends Paul held his nerve to secure 2 singles and win 11-9. The second semi final saw Kevin Conroy aiming for his third SMPT final spot, taking on Gerry McCabe who had had a fantastic run to this point. Gerry made a strong start and held an 8-5 lead after 8 ends, a 3 from Kevin however tied the game with 3 ends to play. With singles being exchanged over the next 2 ends this meant it was a single end shootout for a place in the final. Gerry lay shot in the ditch and with a tricky route in, Kevin’s bowl came up just short and so Gerry made it through to the final winning 10-9. Another tight match between two excellent opponents saw the match tied at 5-5 after 8 ends. A decisive 4 shot run over the next 2 ends however put Kevin into a strong position and despite Eddie’s best efforts he came up short with Kevin taking the Bronze Medal 10-6. It is fair to say that this was not the final many expected. Paul not regarded as a specialist singles player and Gerry having made it through in the face of such recent adversities ensured we would have a truly great battle between 2 players who had bowled at the top of their games to get to the final. Gerry seemed unperturbed by the enormity of the situation and raced into a 5-0 lead after 3 ends. Back came Paul however, and he reduced the deficit to 6-5 after 8 ends. 3 shots to Gerry over the next 2 ends meant he led 9-5 with only 2 ends to go. Paul had it all to do and with Gerry securing a vital 1 shot on the 11th time had run out. 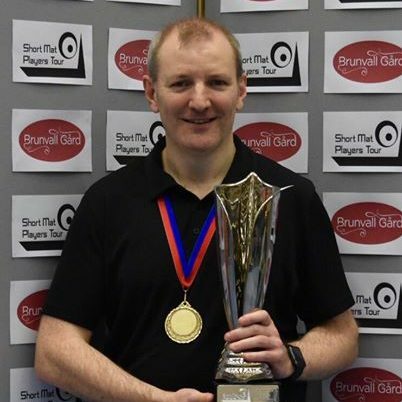 Gerry wins 10-5 and is crowned World Masters Champion 2014.